The Consumer Packaged Goods (CPG) industry is characterized by enormous data volumes with the very large number of transaction records, data coming from multiple sources etc. These unique characteristics of the CPG industry make it an ideal candidate for Machine Learning in combination with advanced predictive algorithms. The traditional analytics technologies struggle with the volume and complexity of the data and that is where exactly the Machine Learning is best suited. In CPG Industry, the Machine learning can be used for improving the effectiveness of marketing campaigns, increasing the performance of the sales team, optimizing the supply chain and streamlining manufacturing. But firstly, one needs to understand why machine learning is superior to the traditional techniques of business analytics that most of the people are using till now. Machine Learning (ML) is a branch of Artificial Intelligence (AI) which focuses on understanding the data intelligence and then automate the learning rules using machines to replicate the same or similar data. Historically, ML techniques and approaches heavily rely on computing power. On the other hand, Traditional Analytics techniques were mostly developed where computing power was not an option. As a result, Traditional Analytics heavily relies on small samples and fleshy assumptions about data and its distribution. Data Structure: While the traditional Analytics can analyze only structured data, the newfangled Big Data technologies and state-of-the-art machine learning algorithms can analyze any data format viz. images, videos, text, emails, unstructured social media messages, server, logs, etc. Data Consolidation: The traditional analytics focuses mainly on internal data but the cutting-edge machine learning technologies can easily create versatile datasets by allowing the merging of internal data with external public data which helps the data scientists to enrich sales and marketing data. Futuristic: Traditional analytics mostly focuses on past data analysis, while advanced machine learning algorithms focus on ingesting all the data and find patterns that can then be used to make accurate inferences about the future. Manual error: Since Machine Learning uses advanced computer algorithms to analyze the data and all the analysis are done totally impartially, so, they are free from any human biases. Faster Delivery: Cutting edge machine learning technologies allow the management to get answers from their data very quickly and efficiently as compared to traditional analytics techniques. So, the business questions can be answered in few weeks not years. Result Interpretation: While traditional Analytics & BI methods provide visualizations which are open and easy to interpretation, the predictive power of machine learning helps us answering smart questions like how many units of a particular product should be produced etc. Due to the enormous volumes of transactions generated by CPG organizations, it is very difficult to analyze such a huge volume of data manually as it overwhelms most of the brave analysts. Machine learning can easily handle these datasets to extract incredible insights from them. CPG products are characterized by short shelf life. Also, considering the large volumes of products any optimization to the oversupply (or undersupply) problem can have a huge impact on return on investment. Machine learning can solve these issues very easily. Accuracy in sales forecast also leads to a better efficiency of Sales & Marketing activities as well as campaign management. Cutting-edge learning based technology can easily merge many data sources (sales, marketing, digital, demographics, weather, etc.) which greatly improves the quality of sales forecasts, understand the underlying demand drivers that influence demand when compared to traditional predictions which are traditionally done on isolated and aggregated sales figures. Traditional demand forecasting and planning systems are restricted to mainly the demand history, while machine learning-based forecasting can take advantage of limitless data, determining what’s significant, then prioritize available consumer insights (demand sensing) to influence future demand using “what if” analysis (demand shaping). This improved Sales forecast can answer the question such as which product should be promoted in a particular month, what type of campaign will be most profitable for a particular product, what consumer segment should be targeted etc. Moreover, almost all large CPG organizations have wonderful ERP systems that hold a wealth of hidden value in their data. Using Machine Learning, this data can be used to create models that can answer several critical questions such as: How can on-time delivery be guaranteed? How to shorten the time to manufacture a product? etc. So, now is the time, the CPG industry should start leveraging modern technologies like machine learning to deliver remarkable customer experience!! Anjanita is a dynamic results oriented professional with blend of Analytics Consulting, Business Intelligence and project management experience comprising of 12+ years from project scoping to entire execution, in several successful shared services organizations in India in technology, CPG & retail sector. 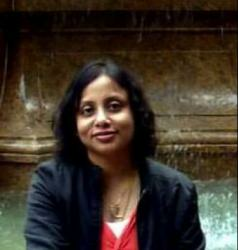 Currently, she is part of Capgemini’s Analytics leadership team.